In the year 2000, a prominent & visionary community member got inspired by a swami of Udipi to start up a Hindu temple in Phoenix metro area. 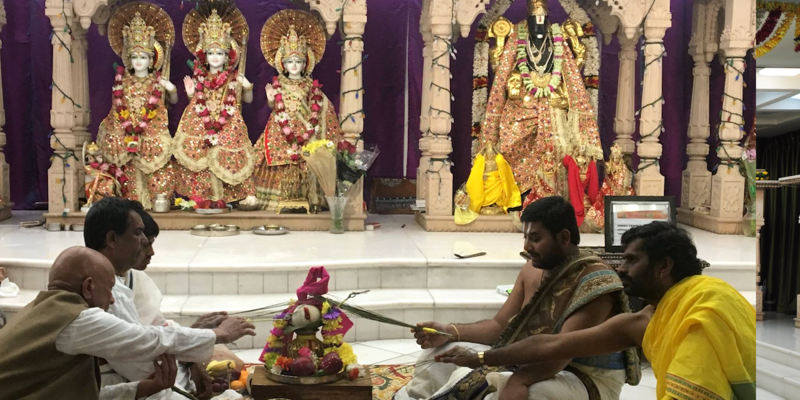 With the passage of some time, more community members got together and the first election of the Hindu Temple of Arizona was held in September 2000. Eleven Board of Directors elected in that election. The name of Hindu Temple of Arizona was registered and a non-profit status under the 501c3 was received in May 2000. There were five sub-committees established during this time. These committees included constitution & bylaws, fund-raising, site-selection, communications, and a building committee. 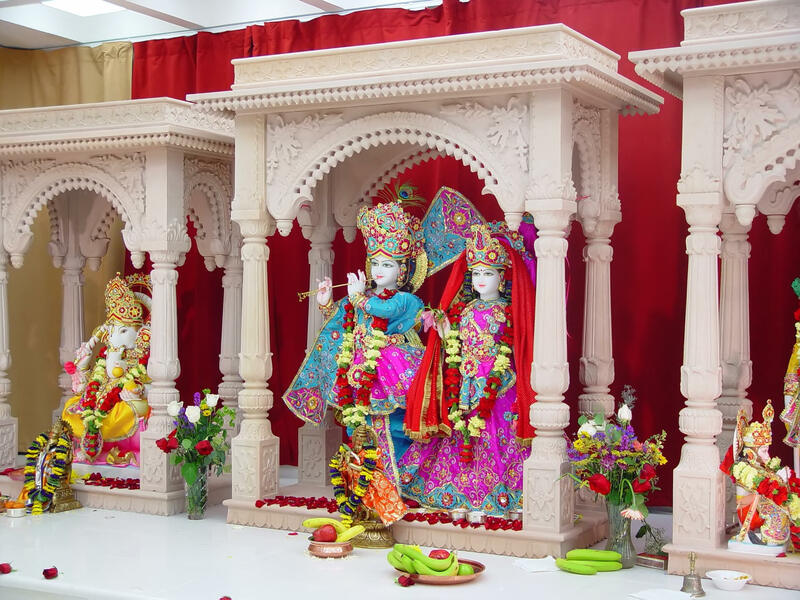 It was about the time to get the entire metro Phoenix community involved along with the Board of Directors to craft a vision of the upcoming traditional Hindu Temple that will meet the needs of the community. The crafted vision created a wave of enthusiasm among the community and the board members and they actively started looking for the land to build the temple on. A fund-raising event was held in May of 2001 specifically for this noble cause. During this time frame, an opportunity came along and a building became available. Several community members stepped forward to provide loans and donations for the purchase of the building which eventually enabled the Board members to purchase the existing property. The current temple facilities were acquired and the first time the doors opened to its devotees in June 2001. It was a collective effort of many community members and the board that resulted into a fruitful result. During the infancy of the Temple, as is usually the case, it was not a self-supporting and self-sustaining institution by any means; hence initially there was not a professional and full-time priest present at the temple. The community and the board felt a dire need of a priest who could lead and perform the day to day Puja events at the temple. Among the several devotees and community members, there was a one particular community member namely Shri Bakshi Jagdish Chander Baglal popularly known as Bakshi Pita Ji, volunteered to carry the leading light and started performing the day to day Puja activities and other temple related religious affairs. The Board drafted a constitution in 2003 and set up the operating structure of the temple. Initially, three main Puja events were introduced in the temple, namely Hanuman Puja on Tuesdays, Mata Jagran and Sunday Puja. The weekly Hanuman Puja started on July 10th, 2001, first Mata Jagran was performed on September 21st, 2001. The temple started offering free Hindi classes to its young devotees. All these events and other programs helped in generating a steady stream of devotees and as a result, the financial condition of the temple started improving. Several devotees came forward to provide interest-free loans for the temple development. After the initialization of the three events, other Puja events like Venkateshwara Puja, Jagannath Puja, Satyanaryan Katha, and Havans were introduced at the temple. The first elections were held in the last quarter of 2003. Other events like Rath Yatra, New Year puja, Janmashtami, Karva Chauth, Saraswati Puja were slowly introduced in the temple. It is a commonly known fact that the committed devotees of this Temple are not only faithful but also are very creative. They are pioneers of inventing new and exciting ways to celebrate each of the main events in a very unique way. From Rathyatra to making Amarnath Gufa, Mata Vaishno Devi Gufa, live audio-video feeds are some of the examples of their creativeness. Their creativeness is parallel to none. Today, this Temple has become the hub of our culture, traditions and religious activities. Devotees from all across the metro Phoenix area come to pay a visit here.